Yomase-Onsen Snow Resort area is located in the northern part of NAGANO. 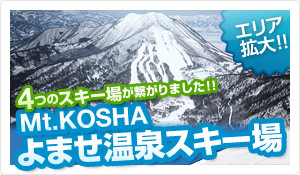 15 minutes drive from Joshinetsu motorway "Shinshunakano IC"
Yomase Onsen Ski Resort, is adjacent to view outstanding open-air bath natural hot spring "Yomase Onsen"
"Yomase-onsen", "Takaifuji", "Komaruyama","Ryuoo ski park"to Yudanaka Station getting to be able to move freely between this area. 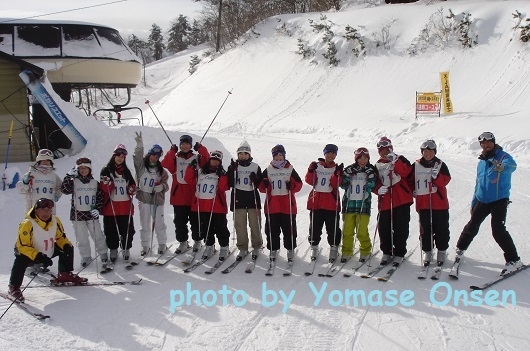 Yomase Onsen Ski Resort is constructed by 12 courses and four lifts,flat widely long burn is characterized. Beginners, from the ski learning educational travel, skiing and snowboarding with even tournament for measurement function until towards the Alpine race competition-oriented, sled, it is ski resort where you can enjoy a wide range such as snow play.